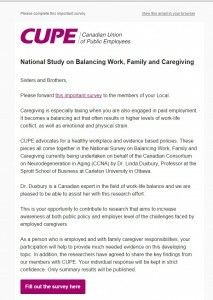 As you’re more than aware, one of the more difficult challenges of our lives is finding a balance between our work, our families and dealing with care-giving issues. It’s not easy to do and often we find ourselves making sacrifices and hard choices. This creates tension and conflict both at work and at home and results in un-needed stress with its emotional and physical consequences. If we can make changes to our working lives which will result in an ability to manage these challenges more easily and reduce the stress they produce then we need to do so. CUPE is embarking on a national survey of our members to gather information which can then be used to raise awareness of the issues, develop policies and design contract language which will benefit us all as we try to find ways to deal with care-giving and work/life balance. Please take a few minutes and fill out the survey. This entry was posted in Community, Survey, Uncategorized by admin23. Bookmark the permalink.